The final meeting of the Stakeholders Committee charged with shaping the 2018 Comprehensive Plan was supposed to be a tidying up session ending with Committee approval of the document for public review and government adoption. Instead it turned into a lengthy discussion of the possibility of commercial development on the western end of Cliff Dawson Road as it meets Mars Hill Road. Citizens who successfully fought a commercial rezone on Cliff Dawson Road late last year and early this year showed up at the meeting last week to find out if there was anything in the Comprehensive Plan that would prevent or encourage commercial development in the area in the future. Members of the Steering Committee, led by Chuck Hunt, told the group that the Comprehensive Plan did not directly address their concerns and that they should continue to focus their attention on the Planning Commission and the Board of Commissioners. The Board of Commissioners, following a negative review of the Planning Commission, turned down the rezone request on Jan. 2. Reflecting what seems to be growing public concern about development in the county as the housing market heats up, the Oconee County Democratic Committee is sponsoring a program at 3 p.m. Sunday at the Watkinsville Library called Carving Up Oconee Revisited - A Public Perspective. Included will be a film and panel discussion of “how a formerly agricultural county struggles to retain its rural nature and natural beauty in the face of mounting developmental pressures,” according to a news release for the meeting. 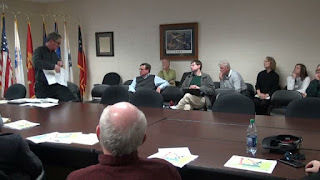 Justin Crighton, a planner with the Northeast Georgia Regional Commission hired by the county as a consultant on the update to the Comprehensive Plan, arrived at the 6:30 p.m. meeting on March 14 at the Community Center in Oconee Veterans Park about 10 minutes late. Crighton turned the Steering Committee’s attention to two suggested revisions to the Future Development Map, which is the most important part of the plan. 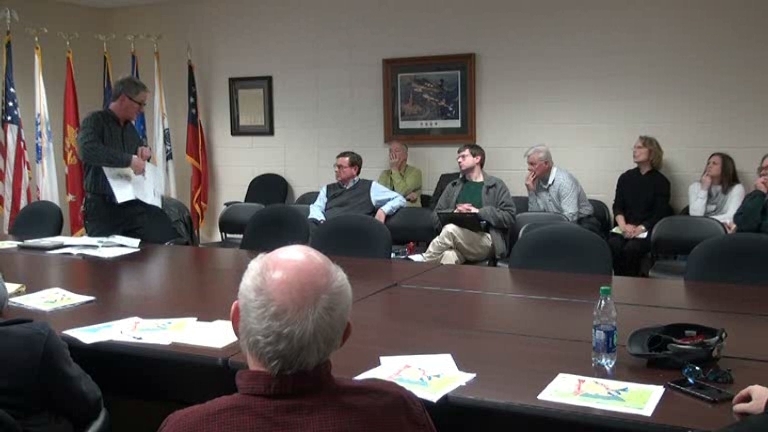 Crighton said these proposed changes came from citizen input at the Public Forum on the Comprehensive Plan held on Feb. 5, also at the Community Center in Oconee Veterans Park. The first of these was along Mars Hill Road between Briar Lakes Road and Malcom Bridge Road. Crighton said he had received suggestions from several citizens that the area south of Mars Hill Road be shown as appropriate for residential rather commercial development. In the end, the Steering Committee extended the residential area designation all the way to Malcom Bridge Road, encompassing Malcom Bridge Elementary School. The second proposal that Crighton offered was for an extension of the industrial area on the south side of Watkinsville to include most of the area between SR 15, Greene Ferry Road, and Old Bishop Road, all outside the city of Watkinsville. Crighton said the proposal came from an unidentified member of the Oconee County Industrial Development Authority. Matt Elder, a member of the Authority, owns land around his Oconee Waste Transport headquarters, which would fall in the new zone proposed by Crighton. Ed Perkins, a member of the Steering Committee and of the Industrial Development Authority, said the proposal did not come from the Authority itself, which he said had never voted on such a request. Crighton’s proposal received no support from the Steering Committee. Only seven of the 29 members of the Steering Committee were at the final session. Eighteen other citizens were present, and most of them asked questions, starting at the beginning of the meeting, about Cliff Dawson Road, raising concerns about the spread of commercial development up Mars Hill Road from Butler’s Crossing and east along Cliff Dawson Road. Crighton acknowledged little familiarity with the area and allowed Hunt, who is a member of the county’s Planning Commission as well as of the Steering Committee, to respond to most of questions. Hunt repeatedly said that the Land Use Map would not change the situation regarding commercial development along Cliff Dawson Road and that nothing in it was different from the Land Use Map from the existing 2008 Comprehensive Plan. The discussion did lead the Steering Committee to ask Crighton to change the designation in the Future Development Map to reflect the large agricultural tracts owned by the University of Georgia and the U.S. Department of Agriculture in the area around Butler’s Crossing. The Future Development Map at present and as proposed by Crighton shows them as open for development. Crighton said he will find some way to indicate that these are green spaces that the county expects to remain undeveloped in the future. Late last year John Hadden III and Jennifer Hadden had asked the county to rezone 6.3 acres at 1110 Cliff Dawson Road from agricultural to business use so they could construct a barn-like reception facility on the property. The Haddens had poured the foundation for the barn but not actually constructed it on the 15 acres they own on Cliff Dawson Road between Moss Creek Drive and Mars Hill Road. The Haddens also own a second, adjoining property of 9.3 acres, bringing their total acreage on Cliff Dawson Road to just 24.3 acres, according to county tax maps. The Haddens have planted blueberries on their property and dug a pond, and the barn would be used for processing the blueberries and as a receptive hall for weddings and other events, the Haddens said. In documents they submitted to the county, the Haddens acknowledged their plans for the property had changed several times since they purchased the property in June of 2016. They also acknowledged holding a birthday party with an outdoor concert on the property on Oct. 13, 2017, with about 250 people in attendance. The east side of intersection of Cliff Dawson Road and Mars Hill Road already is used for or zoned for commercial development, but much of the area north and east of the Hadden property is residential. Residents of those subdivision, including from Meadow Springs to the north and Moss Creek to the east, complained about the noise from the birthday party in the hearings held by the Planning Commission and the Board of Commissioners. The larger concern, however, was the one raised by the citizens at the Comprehensive Plan meeting last week, namely that the spot rezone for the reception hall would allow the property and area to become commercial across time and adversely impact their neighborhoods. Current tax records show the property as still owned by the Haddens, but they had put all 24 acres on the market earlier this year. The property has been withdrawn from the market, and several citizens at the meeting last Wednesday said they believe the property has been sold. Crighton that he will send the final draft of the Comprehensive Plan, with the changes from the Steering Committee meeting, to the Georgia Department of Community Affairs for review. Following that review, the Comprehensive Plan will go to the Oconee County Planning Commission, where a public hearing will be held on April 16. From the Planning Commission the document will go to the Board of Commissioners, where another hearing will be held on April 24. A draft of the plan with editing comments still embedded in it is on the county web site. The video below is of the entire meeting on March 14 of the Steering Committee. No microphones were used. To compensate, I increased the volume of the audio in editing. Unfortunately, this also amplifies the feedback and background noise. At times, the sound is very clear, and at others, it is distorted. I apologize and will do a re-edit to try to address the problem. Eva Kennedy, a planner at NEGRC who has assisted Crighton in the meetings of the Steering Committee, began the session but then allowed for a break until Crighton arrived. Crighton began his discussion of the suggested change along Mars Hill Road at 12:19 in the video. The proposed expansion of the industrial area begins at 32:32 in the video. Citizens asked about Cliff Dawson Road early and often during the meeting, with discussion most intense beginning at 55:44 in the video. Comprehensive Plan 3 14 2018 from Lee Becker on Vimeo. Unidentified member of the Industrial Development Authority?? An upcoming change in the Oconee County Ordinance will negatively affect many of the current and future residents of Oconee County. Oconee County Commissioner's are voting to remove your right to construct a home on a slab foundation. This decision affects everyone: large tracts, small tracts, privately owned tracts, and current subdivisions lots. The Commissioners' vote is final; Oconee County citizens will not have the opportunity to vote on this change. If you believe in slab construction, then be responsible and ethical enough to sign your name. It takes a decent amount of $$ to place a full page ad. But it doesn't take any courage of you can't sign your name to it. Hmmm...who would benefit most from slab construction? Unfortunately Oconee County, under the leadership of Melvin and now Daniell, is rife with conflicts of interest, whether the IDA, Land Use & Planning Committee, State Transportation Board, etc., etc. The people on this committee really should be ashamed of themselves. They agreed to do this important work, knowing it would take a fair amount of time. Yet consistently only a few show up, 7 of 29 is terrible. Glad the citizens are showing up to voice concerns and glad they did not agree to a last minute change to the plan for the area south of Watkinsville, sneaky effort after most public input. "Members of the Steering Committee, led by Chuck Hunt, told the group that the Comprehensive Plan did not directly address their concerns and that they should continue to focus their attention on the Planning Commission and the Board of Commissioners." The pretty colored map has NO authority. It is but a suggestion. Each and every new land use, whether it be a rezone or building project, is beholden ONLY to the vote of the Board of Commissioners. The candidate challenging Bubber Wilkes is "pro-growth" and "pro-small business" all the way. He can be counted upon to vote "Yes" for any rezone contemplating building.